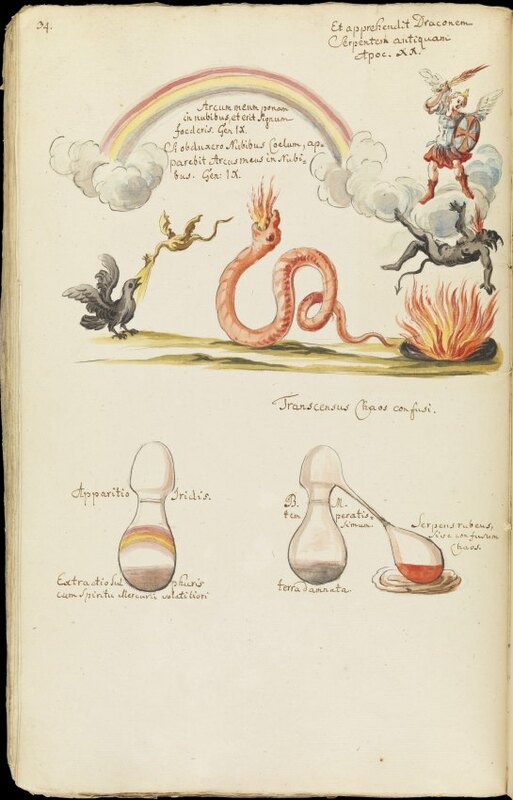 The Wellcome Library in London has a significant collection of alchemical manuscripts. Among the many important items is the little known early 18th century manuscript, Wellcome MS 4775, entitled Thesaurus Thesaurorum et secretum seecretissimum. We will see this as being almost unique among alchemical manuscripts as it ties together the emblematic depiction of alchemical process with the physical laboratory work. Many of the pages of this manuscript are to be seen as divided into two levels, and upper level where there is an emblematic expression, and a lower one in which simple laboratory processes are shown. It is obvious that these are two ways for describing the same alchemical reality. 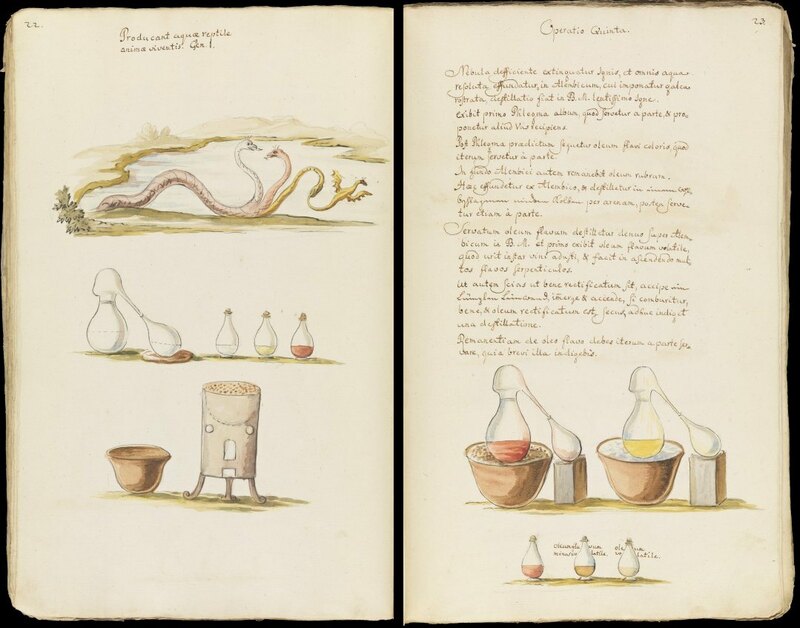 In most alchemical manuscripts we either have drawings of alchemical apparatus or emblematic pictures. Different alchemists were drawn to use either physical images or allegorical emblems, and rarely do we see the two in parallel. Wellcome MS 4775 is thus very special, in that it gives us an insight into these two parallel descriptions of the alchemical process. I will show here two images. The first shows three headed serpent beside a pool. One head is white, one red and the other yellow. From the yellow head emerges a little flying yellow dragon. Below we see the physical equivalent. Here an alembic is fitted with a receiving flask. This is presumably to be set on the furnace. Through this distillation are to be extracted three liquids, indicated by the three receiving flasks - one with a white liquid, one with a golden yellow and the third with a red liquid. Presumably these three differently coloured components were extracted by different degrees of heat, what chemistry today calls fractional distillation. The picture on the following page perhaps makes this more explicit, as the red fraction is distilled on a sand bath, while the yellow one is driven off on the lower temperature water bath. Although not stated presumably the white fraction is extracted using a lower level of heat, say that obtained by placing in a warm place, such as in the residual warmth of the ashes in an extinguished furnace which we see at the bottom of page 22. The first image from Wellcome MS 4775 shown above is relatively simple. This second image is considerably more complex, incorporating a number of familiar alchemical symbols. "I do set my bow in the cloud, and it shall be for a token of a covenant between me and the earth. And it shall come to pass, when I bring a cloud over the earth, that the bow shall be seen in the cloud." In the lower section we find a flask fitted with a still head. There is a dark coloured substance at the bottom of the flask. The text states "the extraction of sulphur with the volatile spirit of Mercury". The sulphur is the winged yellow dragon, while the volatile spirit of Mercury is the crow form. Above we see a red snake breathing forth flames. This is likely to be depicting the heating of the flask. Higher up this flask are bands of different coloured sublimates. These are paralleled with the rainbow. This appearance of a rapid cycling through colour changes is often depicted as the Peacock's tail, but here the alternative image of a rainbow is used. "And I saw an angel coming down out of heaven, having the key to the Abyss and holding in his hand a great chain. He seized the dragon, that ancient serpent, who is the devil, or Satan, and bound him for a thousand years. He threw him into the Abyss, and locked and sealed it over him." Below this , the lower level shows an alembic distilling over a red liquid. This is entitled "The passing over of the confused chaos". The flask contains a dark layer the "terra damnata" and is to be heated on a B.M. (Balneum Mariae) at the temperature of the heat created by rotting horse dung, often used by alchemists to create a long lasting constant tepid heat. The red serpent or the confused chaos distils over into the receiver.